Former Yankee Hector Lopez is a joy. He sounds more like a fan than a co-star in baseball history, someone grateful to have been part of it all. That same year, Lopez cemented his own bit of baseball history, becoming the first Panamanian-born player to win a World Series. One year earlier, Lopez became the first native to play in a Series. To this day, he shares the glory with other countrymen. “About the attention I got in my hometown and the country was great. Panama is a small Central American county. It was always a baseball kind of country. They had some players, very good players, before me but never made it to the Big League. Reading the Wikipedia bio of Lopez, it’s important to note that he challenged one of baseball’s last color barriers. 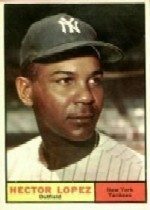 In 1969, six years before Frank Robinson landed his Cleveland Indians job, Lopez assumed the managerial helm of AAA Buffalo Bisons. Tomorrow: What are the best bargains and worst deals for TTM signers? Veteran collector Rich Hanson makes his calls.